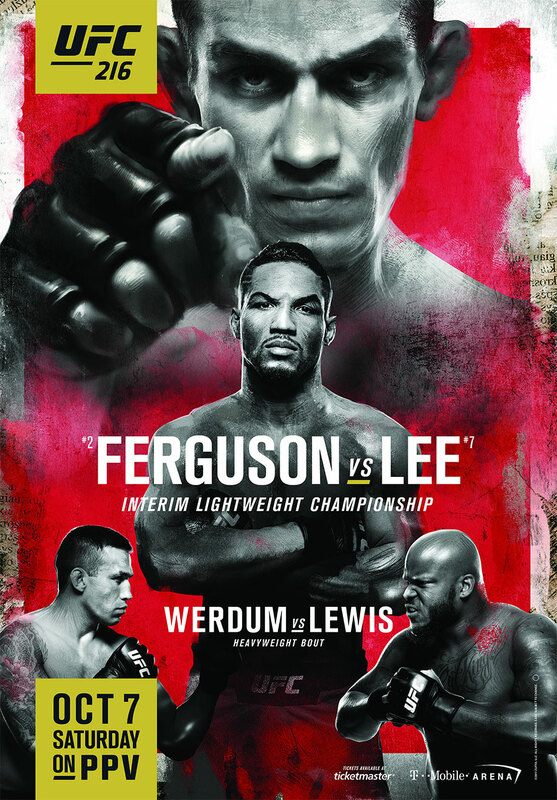 “UFC 216: Ferguson vs. Lee” takes place Saturday night inside T-Mobile Arena in Las Vegas, Nevada. UFC Fight Pass streams the first two preliminary bouts live starting at 7PM ET/1PM PT. FX airs the remaining four prelims at 8PM ET/5PM PT. Tony Ferguson and Kevin Lee battle for the vacant interim lightweight title in the show’s featured attraction. The victor will likely score a money fight against UFC golden child and lightweight champion Conor McGregor in their next outing. Flyweight king Demetrious Johnson looks to set the UFC record for most consecutive title defenses with 11 by beating Ray Borg in the co-main event. The pair were supposed to fight last month at UFC 215, but Borg was pulled just hours before showtime due to a “viral illness,” which most believe was directly related to his extreme weight cut. Speaking of weight cutting issues, Lee was gifted an extra hour at Friday’s weigh-ins after initially coming in one pound heavy. He eventually made weight, but did not look good. It will be interesting to see how his body responds to a five round title tilt just 37 hours later.